Can you hear the sound of hands clapping? Good job and I'm so amazed at your ability to design on your own. Love the quilts and the stories behind them! Beautiful quilts. I love the Arcadia line too. Wonderful quilts, it looks like you are off to a great start on your quilting journey! Lovely quilts. I especially liked the second one. The "L" around the square was unexpected & refreshing! Thank you for your com, Kaye! Your quilts rock! I love how they are cute but contemporary, not like Grandma quilts. Two pretty quilts! I can't believe you have given away your first quilts - that must be hard! I like the design you did on both of them. Credit to you for making your own design - it makes the quilts more special!! those are two beautiful first quilts! Oooh! I love the baby quilt. The colors are making me hungry for sherbert! I too gave away my first quilt. I've grown to be glad about it because after all the others I've made, I'm not sure I'd like it anymore! I love the patterns you thought up for both your quilts!! Makes them stand out from the crowd. Now, you really can't stop there!!!! Both quilts are just gorgeous! I love this little festival, it is so fun to meet new quilters! Thanks for stopping by! Good luck on your etsy shop! Those are both beautiful quilts and I don't think you need patterns with an eye like you have! Glad to find your blog! Well done. Great start to your quilting adventure. Love the colors and your pattern. Not knowing what is ahead seems to allow the first quilt to work as we step off into the unknown. I so wish I could quilt. I just love them! Both quilts are beautiful. I especially like the top one. Great job! I love them both! Very sweet! Both your quilts are great. You should be very proud. I especially like the baby quilt. Thanks for leaving a comment on my blog! I love your sense of color and use of bold fabrics even in the baby quilt. Don't feel bad about giving your quilts away. Most of mine have been gifts. I try to focus on the joy they bring to the people I give them to. Keep quilting! 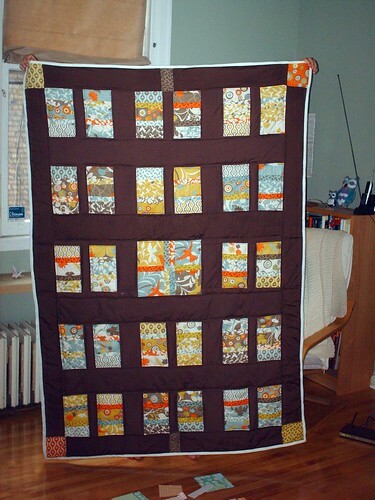 i just love the brown quilt! what a lovely wedding present. Thanks for stopping by and commenting on my quilt. I just had to come and look at yours and I am very impressed. I am hopeless at not using a pattern and your 2 look just beautiful, your colour selection and the simlicity of the desings are great. Lovely! Both quilts are oh so cute! Beautifully made! You're quilts are beautiful and I'm very impressed with the fact that your first quilts go beyond just squares sewn together. Great job. And, I love Arcadia too. That was a great line. Kaye, your quilts are wonderful. You are very talented. You quilts look like you have been doing this for a while. Thanks for sharing! This is fantastic!! We always remember our 1st quilts in a special light. So good to find you in blogland. Thanks for the nice comment you made on my quilt. You have done any amazing job on your first two quilts. Definitely the look of an expert quilter and not a beginner. Love the face that you were able to see a design in your head, cut the fabric without a pattern and go for it. Very talented indeed. I love both quilts. I love the fabrics you chose for both. Beautiful!!! If these are your first quilts, what will the future bring? Very very beautiful quilts. Thanks for dropping in at my blog and your comment. Well done with your first two quilts! They look lovely and you clearly have a good sense of colour and are a natural sewing! I too just love arcadia!! I bought some and it is sitting in my drawer still... waiting for inspiration and time!! Bravo on two fantastic quilts. I'll be anxious to see all the gorgeous ones in your future!! Thanks for stopping by my blog. I look forward to seeing your future quilts! I saw your quilt yesterday right as the router burned up, so I never got to comment. Boohoo, glad to be back. You did a great job with the coin stacks and the browns, good for you. You are very brave deciding to make a quilt for a wedding gift when yo've never made one before. It turned out great! What a fun couple quilts! Hi, Kaye! Your quilts are fantastic. I love that you just thought, "Hey, I'll make my friend a quilt for her wedding!" Very ambitious of you. Your fabrics and colors are outstanding. I hope you get to make a quilt for yourself soon! You did it? You just made your first quilt, just like that, just jumped right in without a pattern or instruction ! Girl, you've got quilting in your genes ! And that second one ! People probably try to talk the girl out of it ! Blessing on your Etsy shop when you're ready and your machine decides to 'straighten up' ! I love your quilts! So excited I found your blog... can't wait to see what you make next! Awesome quilts! Love you r fabric choices. Looking forward to seeing what you come up with next! That looks great. I love the bright colours that still somehow soft. Wow! Your first two quilts are just gorgeous! I can't wait to see what you come up with next. Great quilts! Love the colors. Quilts are often gifts from the heart and both of yours fit that description. They are lovely and one of a kind. Keep exploring and creating with fabric - it will take you on many interesting journeys. Both beautiful quilts! I love that you made up the pattern for each. The colors are beautiful, you did a great job! Lovely quilts both of them but I think the baby quilt is my favourite. Great design and very pretty fabrics. I love both your quilts! Great designs to show of the beautiful fabrics! You are super talented, Kaye! Love both quilts, expecially the baby quilt. Reminds me of my store bought one that i loved so much as a kid. I still remember it! I would have never believed you were a beginner :) BEAUTIFUL quilts, thank you so much for sharing! Beautiful colors on both quilts! Great job. Beautiful quilts! These are both lovely! Fantastic quilts! And kudos to you for diving right in - they turned out great. Beautiful quilts. I love your gift for color. Hey there, you've got a pretty amazing blog going on, I'm sure I'll be back! Found you through the quilt festival of course. I can't believe you just thought up the pattern for the wedding gift quilt - it's amazing!! Do you have a PEI connection or are you just interested in LMM and the Anne of Green Gables books? Sorry, you've probably posted about it previously... Just asking since I live in PEI. I'm always excited to find Canadian quilters. I love your quilts -- particularly the baby one. Absolutely adorable and oh, so cheerful! Oh, thank you for the invite! My RSVP to bunny slippers on your coffee table is a big fat affirmative! Let's chat...and have fun with whatever is in our mugs! I love girlfriends, and the more the merrier, don't you think? (Oh, but BFFs are the very very best!) So... your quilts are darling! 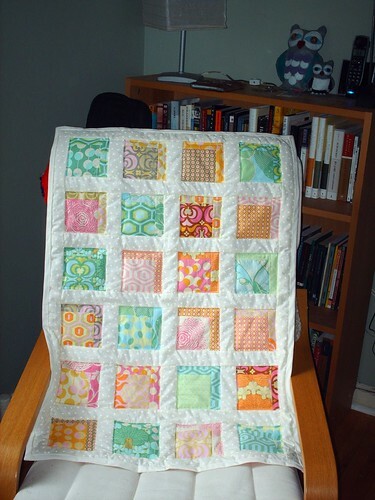 Pinwheel quilts look like so much fun that they are my favs, but I've never made one, for the same reasons you stated. However, now that you are trying, I will put that on my agenda. Your friend is going to be so blessed to get that quilt from you! Very special!!! Thanks for the cheer on my blog. Loved it! :) And, oh! My little verification word for this comment is 'laxiti'. It sounds so whimsical that instead of ever again saying that awful word 'lazy', I will simple let my new updated one roll off my tongue, as in "I am in a laxiti mood this morning!" Doesn't that make you want to just keep those bunny slippers propped up a bit longer? Very beautiful quilts! Love the fabric choices. I am trying to work my way through the Festival. So many lovely quilts to look at. You are very talented. Both quilts are beautiful. It is very hard to give away quilts, but it only means you get to make more. Both of these quilts are very beautiful! Awesome work! Absolutely beautiful quilts. You have a great eye for color & design. Such amazing work for your first quilts! I too am just starting to venture into quilting and it's not nearly as hard as I thought it would be! they are both very pretty. I love the bright colors in the second quilt. I love them both! I'm right in the middle of quilting my first quilt, and I didn't use a pattern either. Or a kit. Choosing fabrics and doing the math to figure out how to put the whole thing together nearly put me in the mental hospital. But now I'm hooked!! I'm going to have to try a baby quilt next - I love yours! So sunny! Well, it's me again, and guess what? I love girlfriends! New ones (that's you) and old ones (that's lots, that the Lord saw fit to crown me with). So, blogger friends for life, here we are! Now, hoooray for your kindred love of books. I knew I liked you right from the get-go, and now I see one reason. Being a librarian is such fun...the books...opportunities to share the love of them with others, well, it's just fabulous! Welcome to the club! :) I will definitely order that book and look at her site. I didn't even think to see if she had a blog! Oh, and yes, please! I would love to see all the patterns for the pinwheels!!! What a happy surprise! Thank you! Love that Amy Butler quilt! So fresh! Wow, your first two quilts are wonderful! Did you save some of the doll quilts from your childhood? I love them both! The colors in the baby quilt are so lovely. I am also a newbie quilter with only about 3 completed. I have a couple more tops finished that still need quilting. Both quilts are lovely and I especially love the dramatic dark color contrast in the first quilt. You two quilts are wonderful! I gave away 6 quilts before making one for myself to keep. We all have to start somewhere and you are doing great so far .... keep having fun. Your quilts are great! I love the colors of both!